Oh, how the mighty have fallen! At the beginning of the season, Hudson Fasching was on everyone’s first round list. He was a “can’t miss” power forward destined for greatness. At his point in the season, he’s doing his best to stay afloat as a possible 2nd or 3rd round draft selection. Hudson Fasching is, simply put, a power forward. His hulking body allows him to camp out in front of the net. He’s tough to take the puck away from, and for a man of his stature, has very quick legs. Fasching is a bruiser in all three zones and displays equally adept defensive skills as offensive ones. A tough player to handle against the boards and in the open ice, the future Minnesota Gopher uses his brute strength to barrel over players if they get in his way. He’s shown patience in his game, but does cough up the puck too often for his own good on occasion. The main knock on his game from last season has been his consistency. Fasching came into the year with so much promise, but hasn’t been able to capitalize on his chances throughout the season. 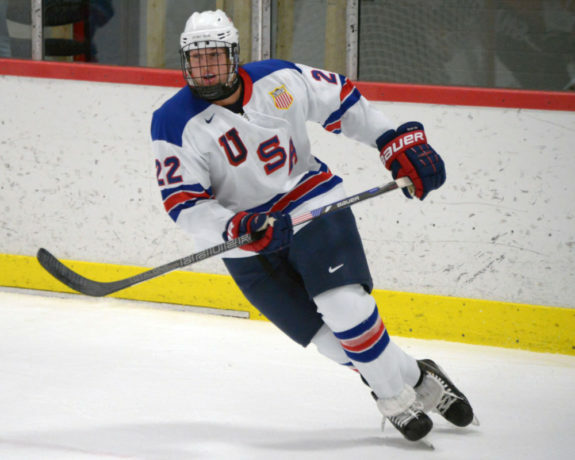 After a promising season with the U17 USNTDP squad, which saw him score 16 goals and 20 assists, Fasching, for whatever reason, was unable to sustain his offensive prowess with the U18’s. There are aspects of his game that are going to be intriguing for general managers around the league, but you can’t expect any of them to risk using a 1st (or even 2nd) rounder on a player who hasn’t shown the capability to finish. You may see him selected late in the 2nd round of the NHL draft, but a 3rd selection is more apropos for Fasching. “The 6-foot-1.75, 213-pounder is a prototypical power forward with good hands in tight spaces and around the net. Fasching impressed the scouts enough at their last viewing to be regarded as an A skater entering the season. Fasching played for Team USA in the U17 World Hockey Challenge and the U18 World Junior Championships. In 12 total games with Team USA he has four goals and eight assists. – His blend of physical play, scoring touch, and offensive capabilities bodes well for the NHL. He can be compared to guys such as Blake Wheeler, Chris Stewart, or David Backes.